Tirad Mahmoud, CEO , Abu Dhabi Islamic Bank, UAE , at the panel CEO s Debate ‘Islamic Finance: Banking on Emotions or Merit?’ during the Global Islamic Economy Summit. Dubai: Islamic banks have to not just take on and resolve the challenges they face but also reorient themselves in the way they do business to enter into the next cycle of growth and become mature. 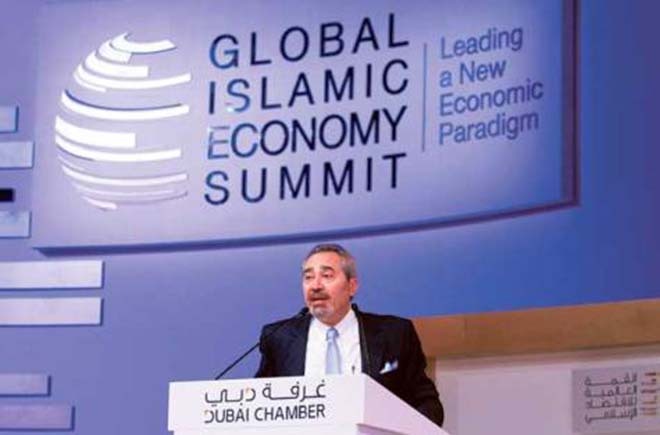 That was the view of a group of banking chief executives during a debate on Islamic Finance: Banking on emotions or merit at the first Global Islamic Economy Summit 2013 in Dubai on Wednesday. In a Brunswick Insight Survey 2013 conducted on behalf of Abu Dhabi Islamic Bank’s 1,000 customers to gauge their attitudes towards Islamic banking, it was found that only 12 per cent to 20 per cent want to do business with Islamic banking, 60 per cent to 80 per cent are indifferent between Islamic banking and conventional banking and between 10 per cent and 20 per cent do not want to do business with Islamic banking. But he also added the challenges of differentiation, cost and size faced by the Islamic banks when compared to their conventional counterparts: He said that differentiation would help to set apart our products from conventional banks and there is a need to cut the costs and be of a reasonable size to achieve economies of scale. And technology can help us to do all of these, he said. Adnan Chilwan, chief executive of Dubai Islamic Bank said: “If we need to make a key effect or impact on the market it is going to be differentiating in nature rather than relying on beliefs”. The products need to be customer need-based rather than bank need-based, Chilwan added. In this regard, there is need to promote innovation and speed of innovation, said Mahmoud. As for reorienting Islamic banking and finance, Mahmoud laid down a vision of the future. Substance rather than form should be brought into the market; creation of straightforward financing that are Sharia-compliant rather than relying on synthetic structures like Tawaroq and, lastly and more importantly, focusing on all communities. Mahmoud said: “As Islamic banks, our objective is to make the world a better place to live in. The world is expanding and we have something to offer to the rest of the world, not just the Islamic community” .